Marjoram is a small herb reaching about ten inches in height, with small oval leaves and white or pink flowers. The essential oil is extracted via steam distillation from both fresh and dried flowers and leaves. Marjoram essential oil has a warm, penetrating and slightly spicy scent with a thin consistency, which is clear with a tinge of yellow in colour. Marjoram essential oil has a wide variety of properties that range from relaxing tense muscles to supporting the nervous and cardiovascular systems. The analgesic (pain relieving) quality of this oil can reduce the pain associated with overexertion of muscles during exercise, help with cold and fever symptoms and ease headaches, to name but a few. This pain relieving quality is enhanced even further due to the oil’s warming effect, which is achieved by dilating capillaries and increasing blood flow around the body, this could also help those suffering from high blood pressure. When used as an analgesic, marjoram essential oil has no adverse side effects unlike other pain relievers on the market. This oil also has the ability to increase perspiration, which aids the removal of toxins, sodium salts and excess water from the body via the sweat glands. Its antiseptic and bactericidal properties make it a very useful ingredient in preparation created for cuts and scrapes, and helps to protect wounds from becoming septic or infected. The positive effects of this oil can also be felt on the mind; it is great for brain function, keeping it healthy and active, preventing it from dulling with age, but also has the ability to calm the nervous system, relieving anxiety and stress. Marjoram essential oil blends particularly well with bergamot, cedarwood, Chamomile, Cypress, lavender, Mandarin, Orange, Nutmeg, Rosemary, Rosewood and Ylang ylang. It can be used in burners and vaporisers to create a calming effect, and is excellent for hyperactive people. It is also useful to lift headaches and migraines and can help with brain function. In a bath or massage oil it can help to reduce the pain of tense muscles after overexertion, and is supportive of the nervous and cardiovascular systems. It has a general warming effect on the body by improving circulation and increasing blood flow. In a cream or lotion, marjoram essential oil uses antiseptic, bactericidal and fungicidal properties to prevent wounds becoming septic, infected or developing fungal infections; also the vulnerary (wound healing) effect of this oil means that the wounds are healed quickly. 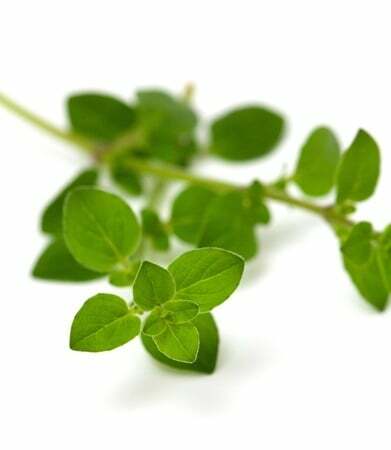 Properties of marjoram essential oil: Analgesic, Anaphrodisiac, Antiseptic, Antispasmodic, Carminative, Cephalic, Cordial, Digestive, Emmenagogue, Expectorant, Hypotensive, Laxative, Nervine, Restorative, Sedative Tonic and Vulnerary. Why do we use marjoram essential oil: We use marjoram essential oil mainly for its muscle relaxing properties, but benefit is also gained from its antiseptic and vulnerary properties. Where do we use marjoram essential oil: We use marjoram essential oil in our Tired muscle relief bath soak. Marjoram essential oil has no inherent risk, but should be avoided during pregnancy.